Born in Den Helder the Netherlands in 1961. Lute immigrated to South Africa with his parents at the age of 2. Lute's father, who was also artistic, passed away shortly after their arrival in South Africa and unfortunately he never had the opportunity to make art his career. As far back as he can remember, he was always busying himself with sketching and other forms of art. It was inevitable that he would become an artist. 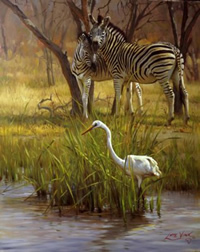 In 1989 he had established a viable market for his wildlife art and his full time professional art career became a reality. It is a privilege for him to be able to share his extraordinary talent with people all over the world. Lute derives great pleasure out of wildlife and nature and respects every aspect thereof. His favorite pastime is visiting game parks, where he not only gets his reference material from, but also finds his inspiration. Lute demonstrates his love of, commitment to and admiration for the source of his inspiration by donating paintings to a fundraiser auction on an annual basis. The proceeds of the auction goes to wildlife conservation. Lute's work is well accepted everywhere. 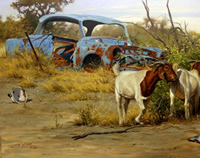 His paintings hang in collections worldwide and he has been credited and published in numerous magazines and publications. His dream to leave the busy city life behind him became a reality when he moved to the Bushveld with his family in 2002.